Nearly an entire calendar year has passed since Hedi Slimane’s latest fashion revolution began last winter, with LVMH’s announcement that the designer would take the reins of Celine and inherit Phoebe Philo’s position as the brand’s creative director. The move was met with the collective shedding of e-tears from Philo’s acolytes and a renewed interest in the latest musings of the man who so savagely assumed the throne of LVMH’s sartorial stalwart of feminism. Now, in January 2019, with all the initial reactions/fallout in our rearview, we are free to judge Hedi’s first menswear-only collection for Celine with a fresh perspective. But can we? Slimane’s storied work has rocked the world of fashion on more than one occasion (pun intended, see if I care) and have had such an immense impact that they are bound to be compared to those from his years at Dior and Saint Laurent, houses which, under his stewardship, metamorphosed from stagnant brands to dynamic attractions. 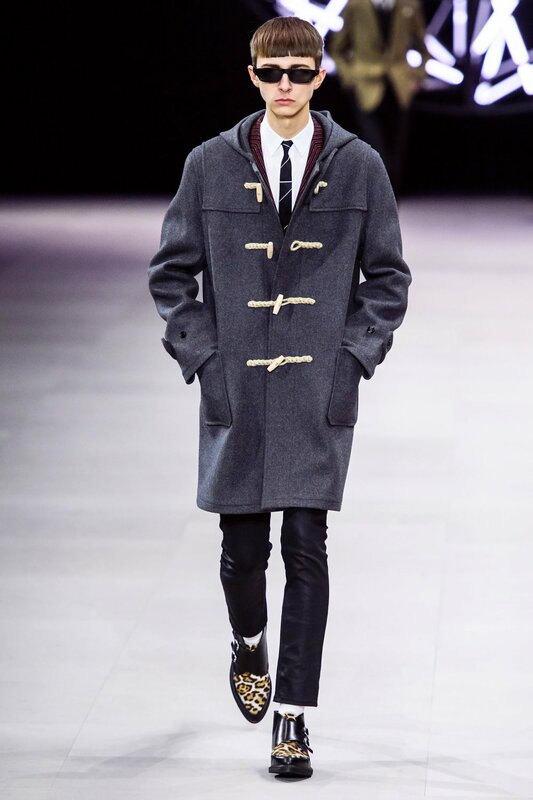 Hedi Slimane headed to London for the inspiration of his latest collection, Celine’s official debut for menswear. Entitled “A London Diary Polaroids of British Youth”, Slimane sent his signature raw-boned models down the runway fitted in plaids, tweeds, leather jackets and retro-style English suits, accentuated by an official score from Canadian “mixed media collective” Crack Cloud and saxophonist James Chance. Although we’re still pining for the next Wyatt, the collection featured military boots, double-breast details, and slim cropped trousers to punctuate Hedi’s bourgeois, rock-infused riff on the ’60s à la Britain. Celine’s lack of menswear heritage has provided Hedi a wide berth of latitude to unveil and execute his creative vision for Celine’s man. Slimane’s critics have challenged his wares as repetitive and reductionist, but the designer’s honed vision has yielded results which have fashion conglomerates and industry insiders alike training their focus on him. As for the fashion community at large, those who rebuke the oversized and baggy trends which have consumed fashion may find refuge in the *mostly* slim silhouettes Slimane offered for AW 2019. 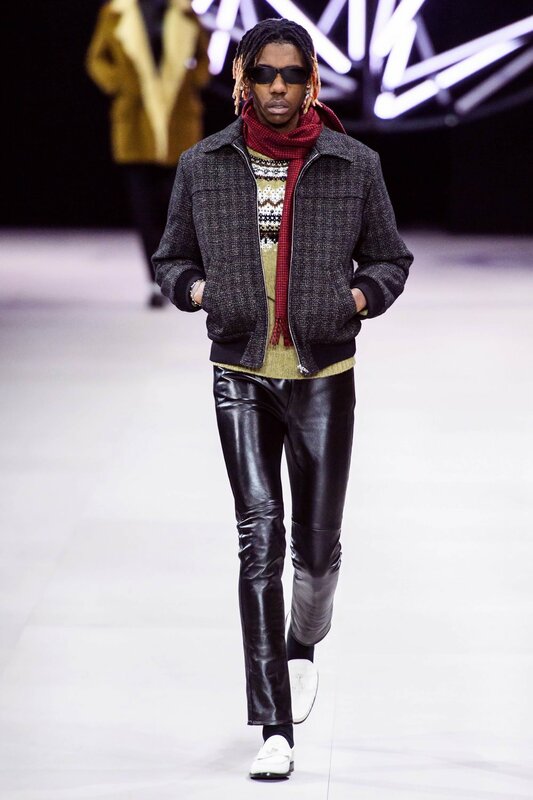 The show echoed Slimane’s own A/W 2014 collection for Saint Laurent, save the vintage overcoats and wider trousers, a slight, but not complete, deviation from Slimane’s trademark. Nonetheless, Hedi’s mold for Celine has been cast and the stage set - now we wait for the clothes.